General aviation in Russia remains in a moribund state, although the potential for its development is strong and the first signs are emerging of hope for the near future, primarily in the form of new legislation. General aviation covers a wide spectrum - everything outside scheduled airline and regular cargo flights, and military flying - including microlights, club flying, gliding and local commercial services. In most countries it serves as a foundation for training pilots and developing services as diverse as crop dusting, sport parachuting and local transport, and is a bedrock of the aviation sector. The poor condition of general aviation in Russia has finally become a matter of concern to the authorities. The fall in general aviation and local airline activity in Russia since the collapse of the Soviet Union has been dramatic. In Arkhangelsk Region, in northern European Russia, for example, the number of passengers using local airlines fell from 203,000 a year in 1991 to 23,500 in 2010, according to the local transport minister, Ernest Belokorovin. That is in a sparsely populated area desperately in need of good local air transport links. The Soviet Union had a vast network of local air services and a huge sport flying association, but both fell into rapid decline in the 1990s and have never been systematically replaced. Perhaps the biggest single problem for GA in Russia, as a result, is that it does not exist - or at least until now it has not been officially recognized and catered for with adequate legislation by the Russian government. That has led to difficulties with excessive bureaucracy for private pilots, and especially for small commercial operators, as existing legislation is designed for airlines. Worryingly, that has caused some local pilots to react with the traditional Russian response to state inefficiency and interference: throwing away the rule-book and doing your own thing. Koshelev describes the state of GA in Russia as “pitiful” but thinks the nation could be on the verge of a renaissance if the state continues as it has started and introduces more relevant rules and regulations. Russia made a landmark move in November 2010, when it introduced new rules allowing GA flyers to operate freely in uncontrolled airspace on a notification basis, without direct supervision by the ATC authorities. That law by itself did not make that much difference overnight, but it was the first significant piece of legislation affecting GA since the fall of the Soviet Union. “This was a massive decision, because so many elements in government and law enforcement were opposed; but it still went ahead after two years of struggling for it,” Koshelev says. Currently, GA in Russia is not regulated by a single agency directly responsible for flight safety, and no direct supervision. As a result, accidents have occurred directly due to flagrant violations of the rules by private pilots, and the overall direction of GA is unclear. There is little incentive to comply with the rules. One Russian pilot was caught flying an Elitar 202 light aircraft in May 2011 with no registration for the aircraft, and no authorization for the flight, and had tried to cover up the fact that his aircraft had force-landed after engine failure. He faced a fine of just 5,000 rubles ($160). “We have regulation here, but no real supervision - no one in government can be bothered with doing anything about this,” says one GA pilot from a club in the Moscow Region. “Hopefully in a few more years we will have a civilized system,” he says. The government, so far unconcerned by the situation, is now responding to the aviation community’s appeals and is starting to act. “In the last year or two we’ve seen a tremendous change in the attitude of state structures towards aviation. There is a lot of movement,” Koshelev says. In the near future, he sees the possibility of change in two areas which should have a huge impact on business and general aviation; new certification rules for small operators, and reducing airport charges by opening airports up to competition. The government is due to consider new rules later this year which would classify aviation companies as either air taxi operators, regional or scheduled airlines. This should make life easier for small local air transport operators, which will no longer face the same requirements as major airlines. The new rules will be similar in concept to U.S. and European regulations, and the RUBAA and government deliberately took the best parts of existing foreign legislation to draw up the new rules. “We estimate those new rules will be up and working in a few months, maybe six months, which will be fantastic,” Koshelev says. Opening up airports to competition for ground services will be another huge boost. 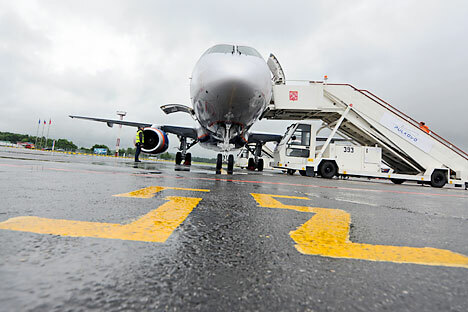 Russian air companies currently pay well over the cost their foreign counterparts pay, due to the lack of competition. The RUBAA wants the government to force airports to open up to competition for services like provision of hangar space and fueling, or be closed down. A similar picture of decline, with some hope of renewal, exists in general aviation aircraft production in Russia. Sadly for Russian manufacturing, most of the likely sources of new GA aircraft seem to be from abroad. Russia needs hundreds, if not thousands of small aircraft to carry out roles as diverse as cropdusting, passenger transport, medical evacuation, training, power line and pipeline survey and firefighting. Many of these tasks are still being performed by Soviet-era aircraft like the Antonov An-24/26, An-28, Yak-18 and Yak-52, and even the biplane An-2 - all decades old. Or, in the case of the An-2, usually far older than their pilots. Foreign manufacturers are cautiously optimistic about Russia as a future general aviation market, and expect strong demand in the near future. Another foreign manufacturer with plans to assemble a twin turboprop in Russia is Canada’s Viking Air, in partnership with Russia’s Vityaz Avia. Vityaz signed a memorandum of intent with the Ulyanovsk regional government in September 2010 on establishing a $7.5-million construction plant to build the Canadian-designed DHC Twin Otter 400 aircraft and a $3.5-million servicing facility. The plant will assemble knock-down kits from Canada initially, but should move to full local production later, says Vityaz’s General Director Sergei Antsiferov. Assembly is due to begin in the first quarter of 2012, with production due to reach 24 aircraft a year. Vityaz hopes there could be a local market for up to 200 or more Twin Otters. Cessna, one of the world’s largest GA manufacturers, is also upbeat on the Russian market, and plans to expand its service network in Russia and establish Cessna Pilot Centers. “Russia’s general aviation development is definitely heading in the right direction. The opening up of Russian airspace will simplify movements and open the market, offering great sales potential for Cessna,” the firm says. Domestic industry has all but disappeared from the light aviation market, but is starting to show tentative signs of a comeback. Russia’s TsSKB Progress, best known as the producer of Soyuz space rockets, is to begin production of its Rysachok ten-seat twin turboprop, intended to be a trainer for Russian state flying schools as well as light utility, transport and parachute roles. The aircraft, designed by Russia’s Technoavia, made its first flight in December 2010. Technoavia has signed firm engine orders for 30 aircraft and has options on another 30 for Russian flying schools. Progress will start production of up to 12 aircraft per year at its Samara plant. If the government passes the promised legislation this year, giving the sector the boost it needs, general aviation aircraft might once again be a common sight in the skies over Russia.